The church is the hope of the world when it's working right...and therein lies the problem. Most aren't. This has led both Christians and non-Christians to give up on the church entirely; it has led many others to give up on all existing churches-and maybe even start new ones. But all church can and should be transitioned to a new life. A church is never beyond hope. This book will provide principles and practices that can lead to a resurrection of any church, in any setting. It will provide the inspiration and information needed to lead a church successfully through the necessary changes of tradition and culture without compromising God's timeless truth. When this happens, the church will once again be what God intended...the hope of the world. 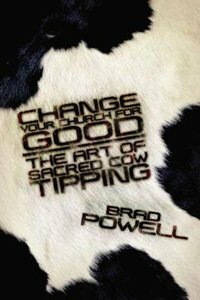 About "Change Your Church For Good"
Brad Powell is the Senior Pastor of NorthRidge Church, which attended by more than 12,700 weekly. Under Brads leadership NorthRidge transitioned from a dying church to an exciting, contemporary church communicating Gods Word, and Brad communicates his message of Change Without Compromise as a frequent conference speaker worldwide and as host of his own annual CWC conference. He and his wife Roxann have three adult children. He is the author of Change Your Church for Good!